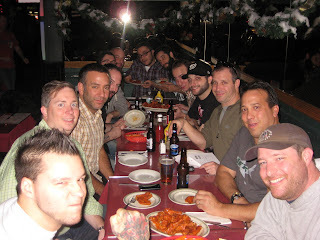 On this event in particular, the gentlemen of Wing-Off raised $130 in donation. 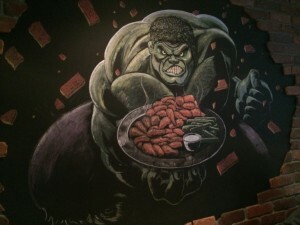 If you would like to donate you can do so directly or through Burger Conquest by click the link on the right side bar. 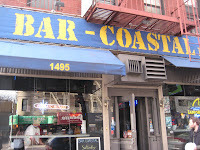 Bar-Coastal is one of the original Atomic Wings licensees in NYC.Atomic Wings is a chain located in NYC that imports their chicken directly from Buffalo, NY and claims to serve them in the authentic buffalo wing way.Most of them are stand alone, but Bar-Coastal, much like Down the Hatch (inspiration for the first ever Wing-Off), serves them in their bar. 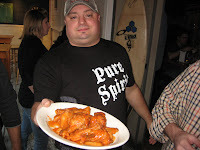 Jason (the man behind Bar-Coastal) and his staff, definitely get an A+ for treatment as they rolled out the red hot carpet for the Wing-Off crew. 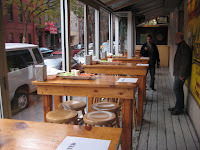 Holding us a few private tables, made it a lot easier for us to sample different wings, compare notes amongst ourselves, talk with Jason and in general, have a great time all while sampling a great beer menu. Serving up Medium, Nuclear, Jerk BBQ and the off-menu special, Kerry’s Way (a mix of honey mustard, bbq and traditional buffalo sauces). 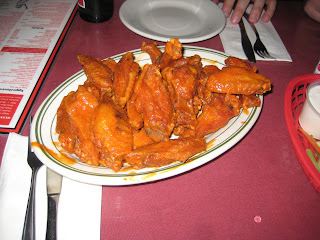 All of the wings were cooked perfectly; Nuclear (Hot) and crispy. Kerry’s Way had a nice spicy meets sweet mix. The crowd fave were the Jerk BBQ, which had a smoked black pepper accent, but for official Wing-Off blessings, we only judge on Hot and Medium. Both of which were hot, full of flavor, meaty, juicy, buttery, crispy and made just the way we like them. 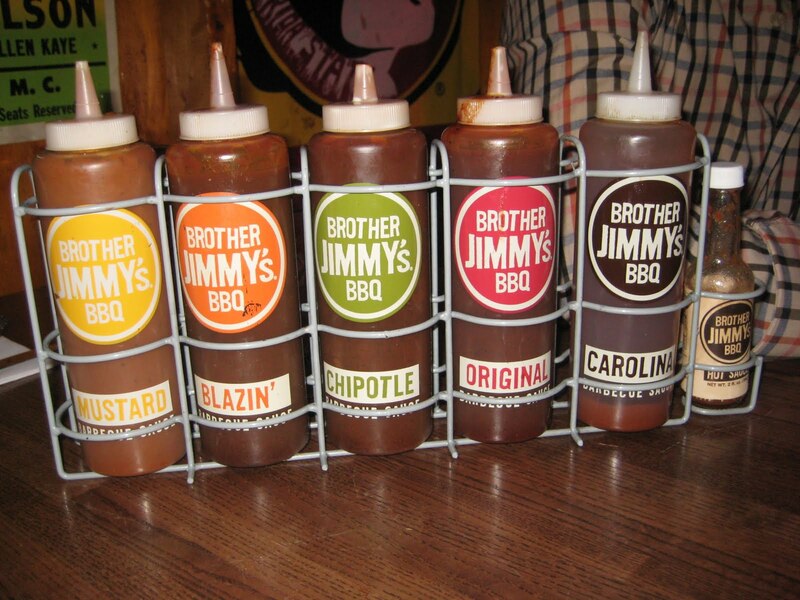 Up next, the NYC based “Southern Style” BBQ restaurant chain, Brother Jimmy’s BBQ. Claiming themselves as the “home away from home for the A.C.C. alumni.” The A.C.C. is a Division 1 conference in the NCAA. 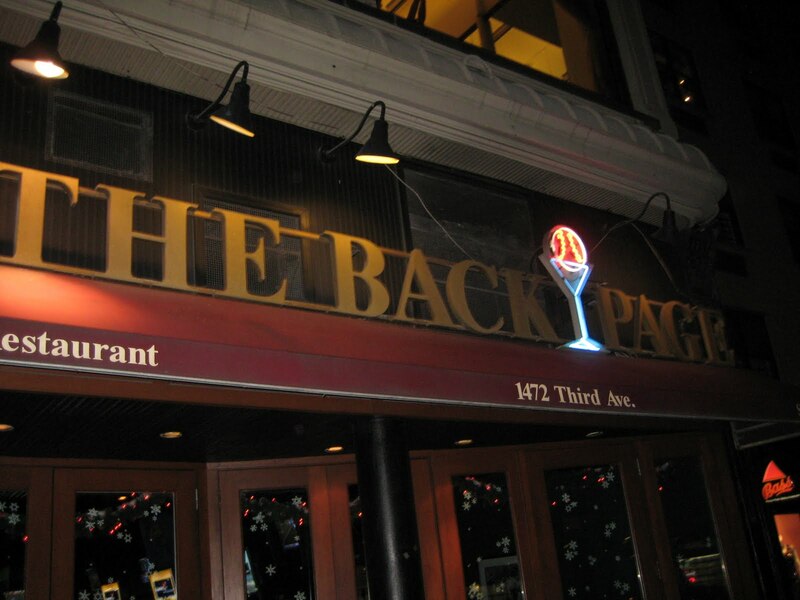 Offering several different locations, each with different themes, we hit the original on 2nd Ave. 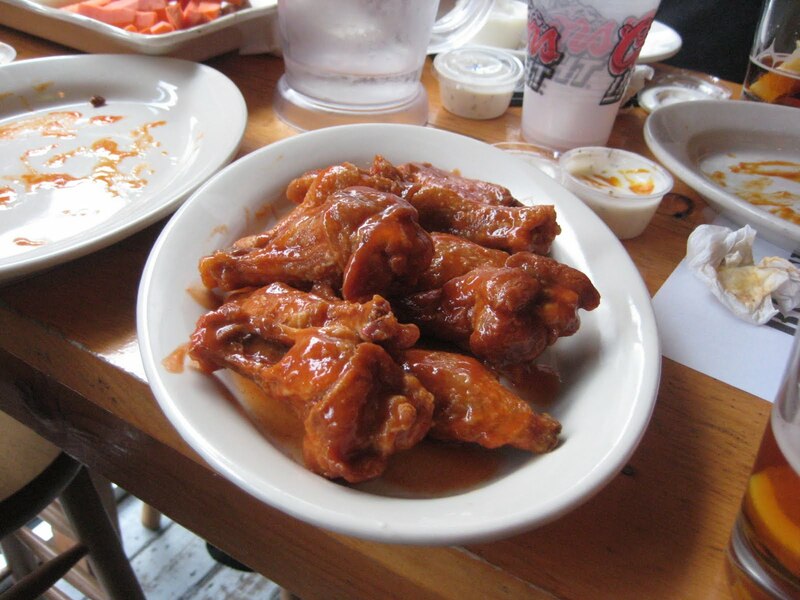 Brother Jimmy’s specializes in BBQ, especially Carolina style but also serves up some well known hot wings. 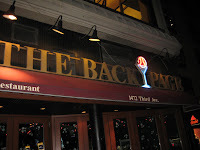 Our friendly and upbeat server Brooke, showed us to 3 tables in the back (always good to move us away from the others!) and promptly took our wing and beer order. Their wings come one of 2 ways, Chipotle or Buffalo (medium) and we ordered 1 bucket of the latter for each table. 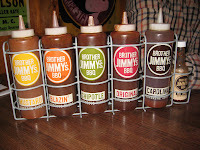 For the sauce oriented, BJ’s offers 6 additional sauces that come on the table, each in their own bottle. 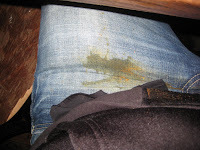 Be careful picking them up as they are not capped and will easily squirt “Blazin'” sauce 2 feet in the air before landing on what was a clean pair of jeans. 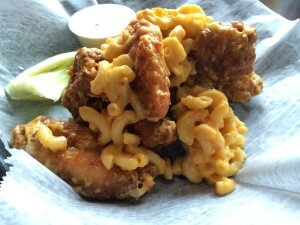 The wings were crispy, served hot, and had a decent flavor. Spice-wise, these wings don’t have much to offer. There is some nice flavor but “hot” these are not. Acting like Bob Ross, I created an easel of the sauces on my plate to paint happy little wings with. They were all decent, but nothing stood out. All in all, some good middle of the road wings but if you want spicy or uniquely flavored, move along little doggy. 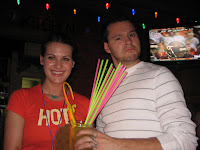 After plowing through our wings, Brooke brought out 3 “Fish bowls,” 1 for each table. 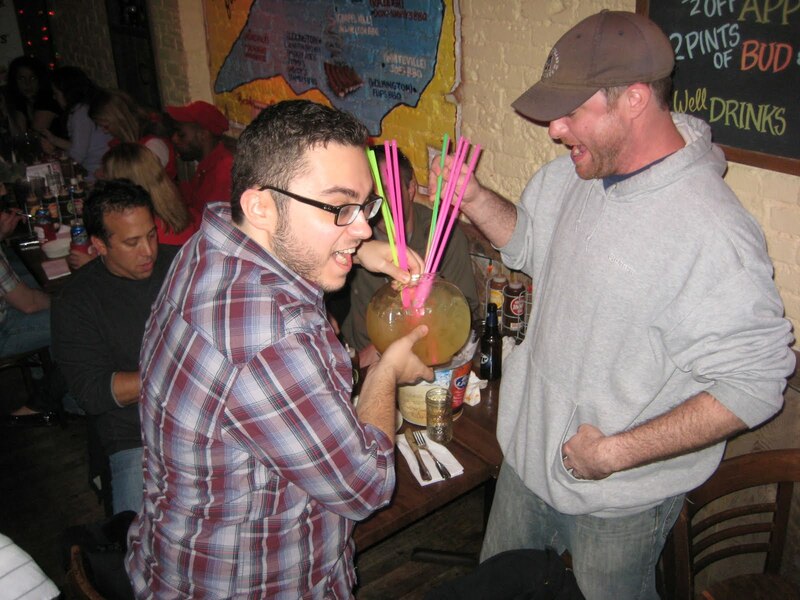 This is a massive fruity mixed alcoholic beverage literally served in a fish bowl with a multitude of straws, usually intended for speed drinking. 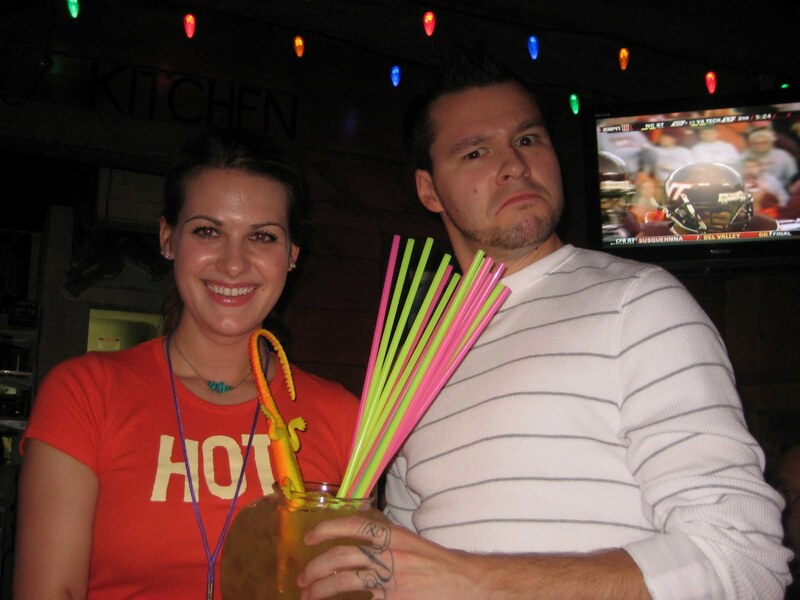 Since the premise of a Wing-Off is a challenge from the get go, we had no problem accepting Brooke’s idea of the tables racing. My table won! Well Brooke, you wanted to make the blog and you did. Hope you’re happy. 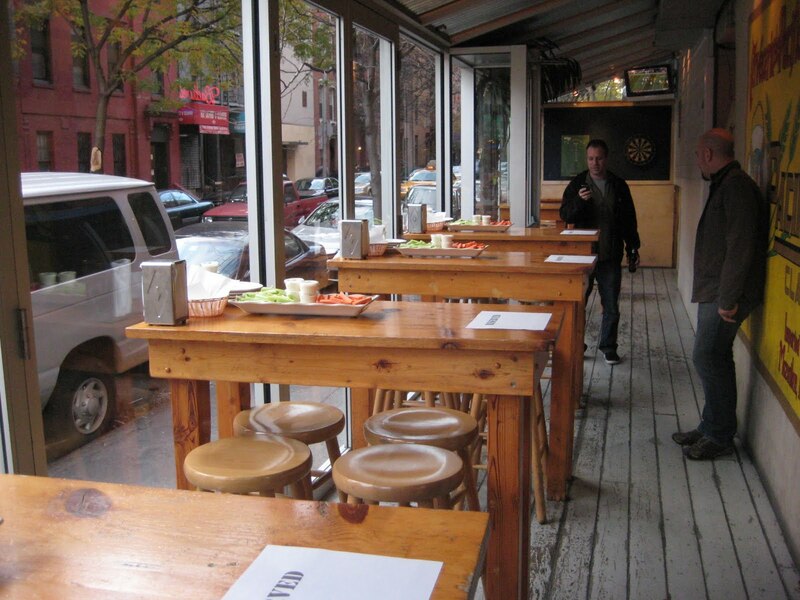 The restaurant was kind of empty which seemed a little odd for an Upper East Side Sports bar on a college football game day but hey, all the better for the Wing-Off crew. 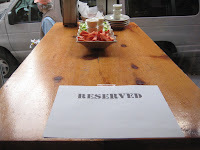 While the place was kind of vibe-less and sterile, the wait staff were attentive and quick. 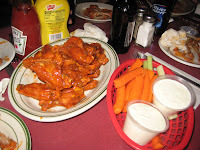 With no delay, we ordered up some Medium and Hot Wings as well as a round of beers. The wings were good. Right amount of meat, right temperature, juicy, buttery, peppered and with a an appropriate amount of heat. This is a decent wing. We tore through them really quickly and placed an order of Extra Hot wings. They arrived without much delay and despite everyone feeling bloated and full, we tore through them. Same wings, but honestly, not that much hotter. 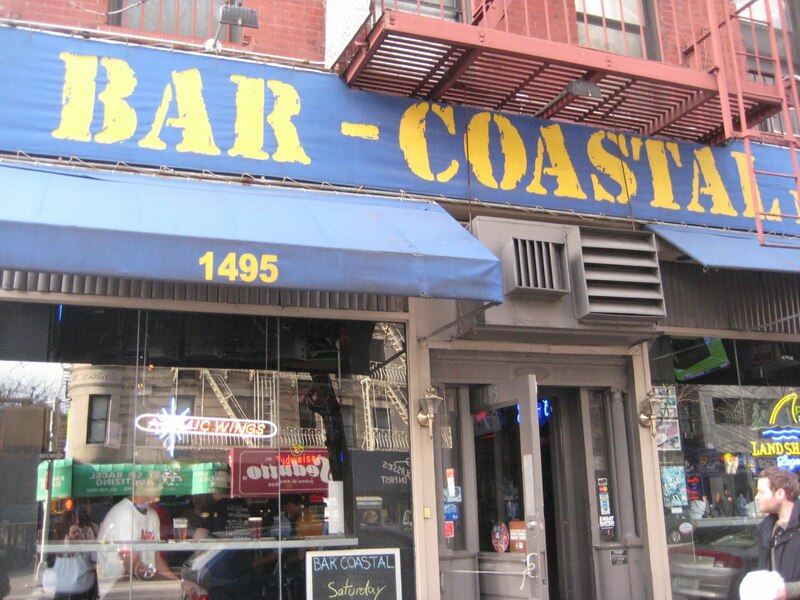 WING-OFF 10 OFFICIAL WINNER – BAR-COASTAL! Honestly, not a bad wing in the bunch but someone has to win. This date in particular was chosen to celebrate a Happy Burgerthday to Wing-Offer’s Kyle and Schap! "Any real wing lover, loves to dip"
Dipping is disrespectful to the chicken and the holy land known as buffalo! 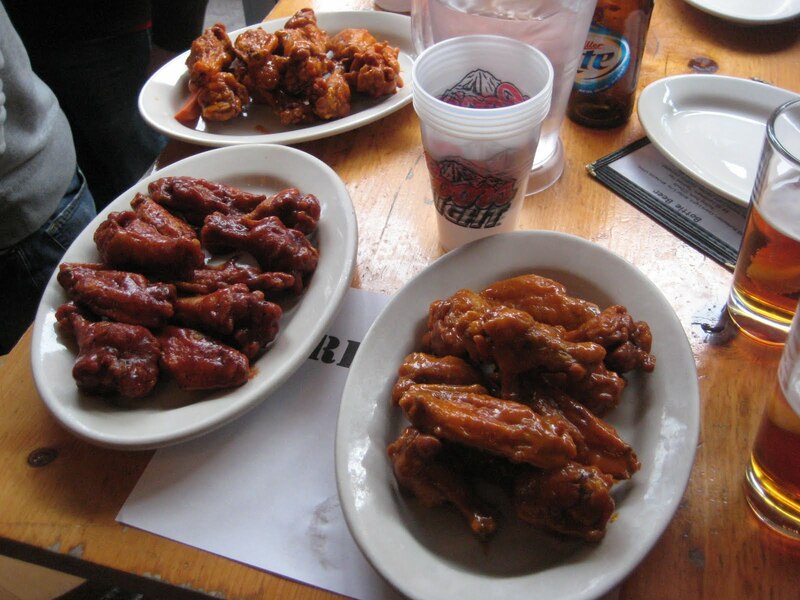 Another good Wing-Off! 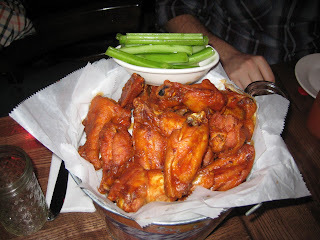 Bar Coastal's wings were really good… I'd like to reiterate. I would definitely not hesitate to bring anyone there for some delicious wings. Bar Coastal is pretty damn good. Not a contender next to Landsedowne, but really solid. 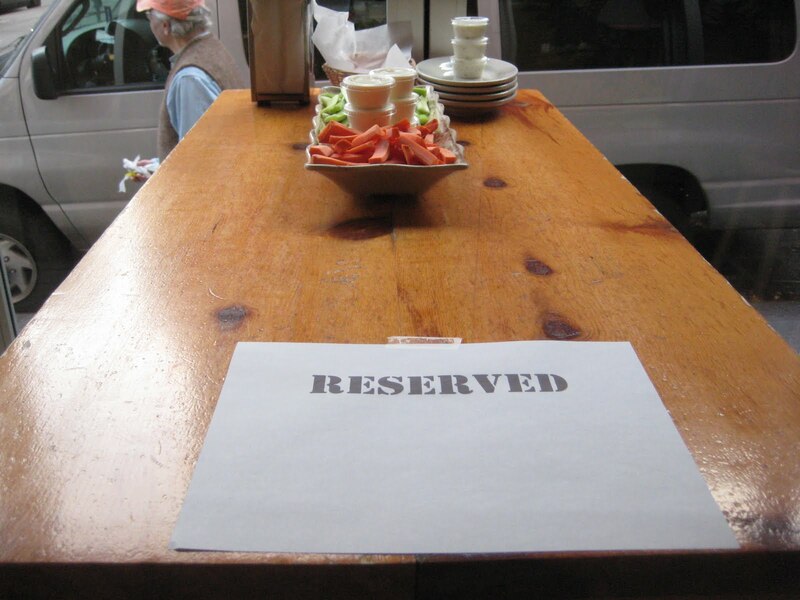 I'll be back there soon, especially for the secret Kerry's Way – that was awesome. Jimmy's is a place I've been to a few times but never thought of wings since I was on such a BBQ mission. They were shockingly good. HUGE and meaty, crispy but still juicy. 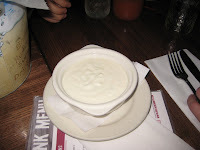 The sauce was definitely boring and salty, but throwing the side sauces on was fun. Back Page was pedestrian and nothing to write home about – usual wings you can get at any competent place. Beer selection was boring and overpriced. 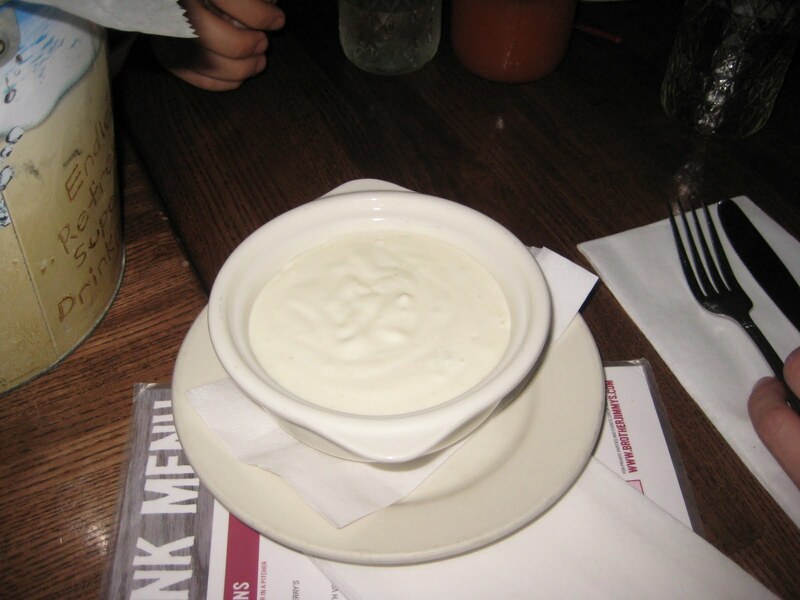 Landsedowne is still king, Mudville is up there (especially their other sauces which I know doesn't count) and Towne Tavern's medium is the best medium we've had. Mr. CWA… The Chicken Wing Aficionado's Kyle Radzyminski calls out Bar Costal for the best overall wing experience. 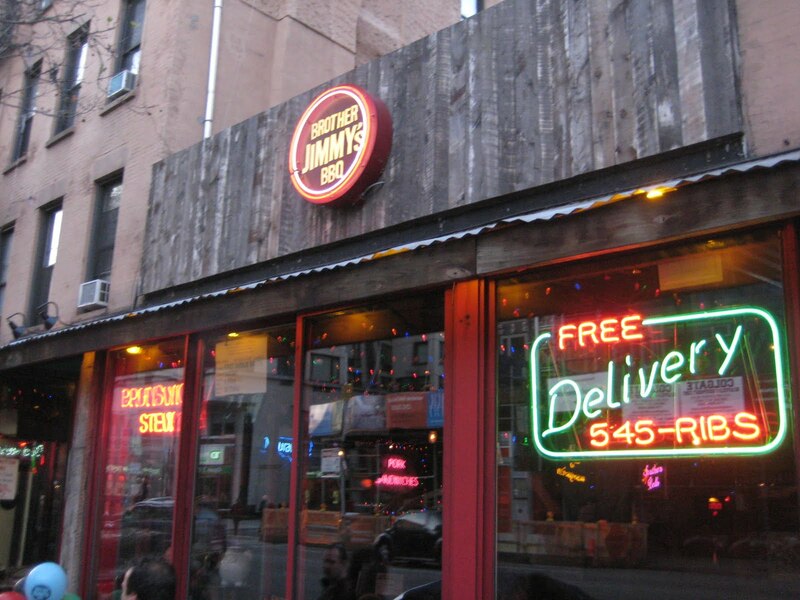 Good wings & good service. Great combination.